Welcome to your retreat . . .
Just what you've been needing. Join us for this autumn gathering at a picturesque, Mission-style ranch nestled in the hills of the Sonoma wine country. Awaken your creative, beautiful, vibrant Self! There is time for vigorous vinyasa flow, alignment-based hatha practice, guided therapeutic yoga, restorative practices, and creative outflow. We celebrate under the Full Moon and walk the labyrinth in celebration and solidarity of supporting ourselves. From past Fall Retreats . . .
Connect with nature and be filled to the brim through full moon observation and celebration, hiking, and daily self-reflection on the lovely grounds of Westerbeke Ranch. Find the inspiration to take steps you have been wanting and waiting to take, and manifest renewed strength and confidence. Come away with a new foundation for growth and expansion and be enriched by the gift of taking this sacred time for yourself. Build your own retreat experience by choosing and blending many different practices for the physical, emotional and spiritual aspects of your SELF. The period around the full moon (including 2-3 days before and after) is an auspicious time. 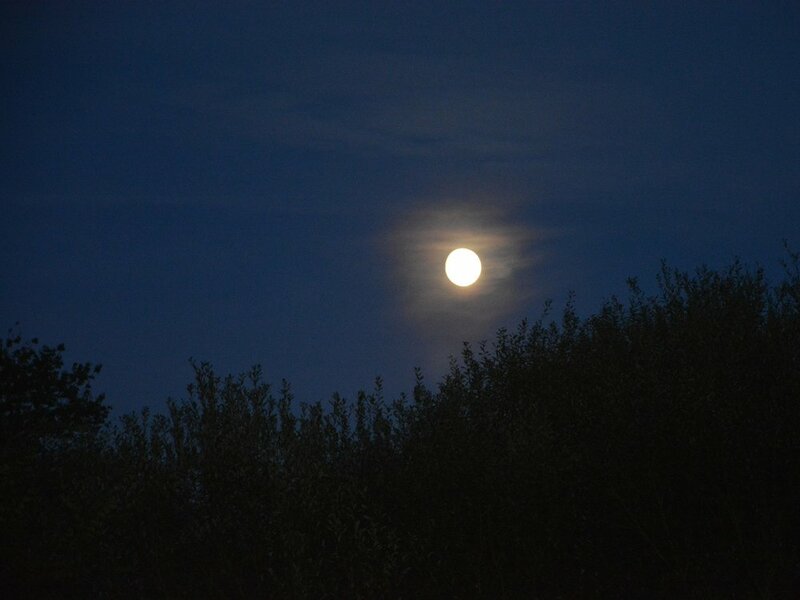 For millenia, people have been enchanted and moved by the beauty and energy of the full moon, using it as powerful inspiration for reflection and personal growth. This year, the full Hunter's Moon happens at 9:45am PDT on Wednesday, Oct 24—almost the exact midpoint of our fall retreat. As such, its energy and influence will be present for the duration of our time together. With the fullness of the moon mirroring the wholeness of life, we reflect upon and celebrate life in all its wondrous complexity and dichotomy, as we embrace and express gratitude for the triumphs and the challenges; the joy and the sorrow—realizing that all of it is serving, whether or not we see it as such in the moment. These are our teachers revealing lessons to us, sometimes painful but always purposeful. Throughout the week, we learn, rediscover and reinforce self-care practices to form a foundation you can take home with you and that will serve as a catalyst for continued personal growth and transformation. When we learn to care for ourselves more fully and more consistently, we empower ourselves to truly blossom, we regain our homeostasis, and we can be more present and fully engaged with the world around us. THE RANCH: Our home for the week is Westerbeke Ranch, a family-owned country retreat with Mission-style architecture and tranquil grounds. It's located just 4 miles from historic Sonoma Plaza, and about a 75-minute drive from the San Francisco and Oakland airports. Built in the 1930s, it nestles amid stately oaks, surrounded by rolling grass hills and vineyards in Sonoma’s Valley of the Moon. The grace and warmth of the Ranch gets inside of you—whether walking the garden paths, warming your hands in front of the crackling “walk-in” stone fireplace, lounging on the lawn around the sapphire pool, or finishing up another deliciously fresh, handcrafted meal. We have booked exclusive use of the ranch for our retreat, which means there will be no other guests on the property during our time here. We'll be able to settle in, make the space our own, and make the most of our precious time together. The picturesque grounds are the perfect setting for relaxation and renewal and include hiking trails, a pool and hot tub, a labyrinth and more. The rustic beauty of this place invites us to quiet our senses and let time slow down, with many spots for private contemplation, meditation or journaling. 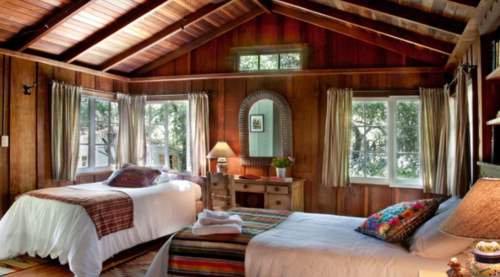 LODGING AND MEALS: Delightful paths lead to five charming redwood cabin retreats, nestled among trees and gardens. Each bedroom has its own bathroom and residence area for privacy and unwinding. The meals at Westerbeke are handcrafted on site from the freshest locally sourced ingredients by an artisan kitchen staff, with attention to individual dietary needs. SURROUNDING AREA: There’s plenty to do in the rest of the Bay Area and the Napa and Sonoma valleys, and autumn is a great time to visit. Why not add a weekend to your trip, before or after the retreat? You can relax in the area's mineral hot springs; drive or hike the scenic countryside; tour the wine country, or explore San Francisco and the northern California coast. Learn more about the area around Westerbeke Ranch here. There are a number of yoga and other self-care practices scheduled daily. Please do not feel pressure to do it all. You may participate in as many or as few activities as you wish. This is your retreat, so make it what it needs to be for you, no one else. It's important that you allow yourself time and space to relax and renew in body, mind and spirit. Go at your own pace. Honor your inner nudges and whispers and let them guide you toward an appropriate level of activity, striking a healthy balance between community time and your own personal time. Take time for yourself, and take advantage of everything the surroundings have to offer — open spaces, breathtaking views, peaceful solitude, and nature's bounty all around. Let it all refresh and nourish the soul! Room check-in opens at 4 PM. Retreat activities begin at 5 PM. The retreat ends after our 12:15 PM lunch. We are asked to depart the grounds by 3 PM. Click here for driving directions and transport info (on the Westerbeke Ranch website). Click here to map it on Google Maps. Airport Transport: Transportation to/from the airport is not included in the retreat fee. Travel Time from Airports: Westerbeke Ranch is about a 75-minute drive from the San Francisco (SFO) and Oakland (OAK) airports, and 45 minutes from Sonoma County (STS) airport, although Bay Area traffic can cause significant delays. If traveling by shuttle from SFO or OAK (see below), plan on about 2 hours travel time. Ride-sharing: Once we have people's travel itineraries, we will help facilitate ride-sharing (car rentals and/or shuttles) as much as possible. Airport Shuttle: For $36 one way, the Sonoma County Airport Express shuttles between SFO or OAK and the Petaluma Fairgrounds Park & Ride. On retreat arrival and departure days, we will arrange free pick-ups and drop-offs at the Park & Ride (25 minutes from Westerbeke). Car Rentals: Sharing a car rental may be more cost-effective than a shuttle service and will allow for more flexibility to explore the wine country before, during or after the retreat. Consider making a refundable/cancellable car reservation as a contingency, and we will help identify shuttle and ride-sharing possibilities as we get closer to the retreat date. Why Not Extend Your Stay? Consider adding a couple of days to your trip before or after the retreat---autumn is the perfect time to visit the Bay Area and Napa and Sonoma valleys! Booking Your Flight: Check out this article for ideas on when to book to get the best fares. * Must register as a full group of 3 or 4. -- A $300 Nonrefundable Deposit is due with your completed registration form. -- The balance is due by July 31, 2018. -- Full payment must be submitted with a completed registration form. -- Cancellation requests must be made via EMAIL to info@lindameacciyoga.com. -- On or Before July 31, 2018: Your payment(s) will be refunded, less the $300 Cancellation Fee (which will be covered by your $300 Nonrefundable Deposit). -- After July 31, 2018: Your payment(s) will be refunded ONLY IF your spot can be filled from a wait list. In any case, a $300 Cancellation Fee will apply (which will be covered by your $300 Nonrefundable Deposit). To request a Registration Form or more information, please use the form below. Please send me a Registration Form. I have a question or would like additional information (please comment below).